Now deceased (June 2006), El Dorado, aged between 18 and 20 years at the time of his death, was considered one of Australia’s finest sires. El Dorado was imported into Australia in 1991, and had a long and illustrious stud career spanning 15 years. At the time of his death, El Dorado was considered to be one of Australia’s most prolific sires, with over 630 registered progeny. Many of these (and their descendants) have had outstanding show successes and fleece data to their credit. 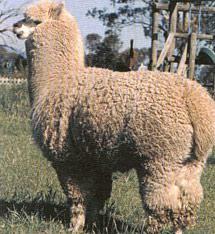 Considered a foundation icon, El Dorado’s presence in an alpaca pedigree is still highly regarded.